Prisoners is an effective-enough film to be appreciated by anyone, but viewers who are also parents will be in for an especially intense ride. There were moments when I felt like curling into a ball in an empty corner of the theater to just shake for a while. It would be easy to make an exploitative movie about the subject of child abduction (and, in fact, it's been done in the past), yet Prisoners mostly avoids going that route, save for one little problem in the third act, which we'll get to in a minute. This is, by and large, a deeply unsettling story that forces you to mentally place yourself in its characters' shoes. Set at Thanksgiving, the movie stars Hugh Jackman and Maria Bello as Keller and Grace Dover. They take their kids to the home of their friends, Franklin and Nancy Birch (Terrence Howard and Viola Davis), for dinner. Both couples have little girls about the same age. During the festivities, they disappear and cannot be found. When the Kellers' son, Ralph (Dylan Minnette), mentions seeing a suspicious RV parked in the neighborhood, they suspect its driver may have abducted the girls. A brooding police detective named Loki (Jake Gyllenhaal) finds the RV and takes its driver, Alex Jones (Paul Dano), into custody, only to let him go 48 hours later due to insubstantial evidence. Convinced Alex is guilty and knows the whereabouts of the girls, Keller kidnaps him in hopes that he can beat the truth out of the man. There are two hitches: Alex has the mental capacity of an 11-year old, and Keller has to hide his actions from Loki, who continues his investigation. The question posed by Prisoners is: What would you do to protect your child? For most of us, that's an easy answer. We'd do anything. The film takes it a step further by asking: Would you do this? Keller becomes so intent on finding his daughter that he's willing to cross a line – to essentially do the same thing he thinks Alex did to the girls. When he doesn't get the answers he wants, he begins upping the ante in appalling ways. Would you do what he does? I asked myself this question. Initial instinct says, of course not. But would I, if someone kidnapped my son? I didn't want to think about this (what parent does? ), yet one of the strengths of Prisoners is that it forces you to confront the part of yourself that really would do literally anything for your child. It doesn't frighten you so much as it makes you frighten yourself. Directed by Denis Villeneuve (Incendies), the film runs two-and-a-half hours. That may sound long, but it feels a lot shorter. This is because the length actually makes the story more intense. Rather than playing like a quickie action movie, Prisoners takes the time to dig into deeper, more troubling issues. There's the grief the Dovers and the Birches feel. There's the relentless pressure Loki puts on himself to find the girls, while concurrently harboring suspicions about Keller. Time is also spent learning about Alex's odd behavior. His aunt (Melissa Leo) gives Loki insight into a man who doesn't process things like everyone else. All these elements have time to simmer, to bury themselves in your consciousness. They, more than any plot development, are what make Prisoners so nerve-rattling. The screenplay by Aaron Guzikowksi additionally keeps you in doubt as to whether or not Alex is guilty, adding yet another later of tension. Hugh Jackman is outstanding as the grieving, angry father. This is a performance quite unlike anything the actor has done before. In every scene, we feel his deepest fears mixing with his rage to push him closer to the edge. We like him, even as we feel aghast at what he resorts to. Jackman brings that contradiction to life. It's powerful, emotional work. Jake Gyllenhaal is a standout, too. He avoids every cliché of the tough, determined cop. Gyllenhaal plays Loki as a man with a self-imposed chip on his shoulder. We're told he has never failed to solve a case that he's been assigned, so he therefore has something personal driving him in this investigation. The interplay between Keller and Loki is always tense. Although working toward the same goal, their approaches are inherently incompatible. The other really vital performance comes from Paul Dano, who portrays a mentally disabled man without veering into stereotype. Not only do we not know whether Alex is the culprit, we don't know if he would understand the horror of what he did if he was. There is one thing Prisoners doesn't quite get right. For most of its running time, the film plays like an in-depth study of powerful, complex emotions in a time of great crisis. Then, in the final twenty minutes, it introduces one or two plot complications too many. This includes a surprise twist that you may see coming slightly before it arrives, as I did. Although it remains dramatically satisfying, the film does feel as though it becomes a more conventional thriller in the home stretch. The conclusion would have been downright unforgettable had it been simpler. A touch of the thematic ambition in Prisoners erodes as it attempts to deliver a “gotcha” moment. It's a forgivable sin, however, because everything else is so spot-on. Seeing a thriller that focuses on the human element rather than solely on the action aspects is refreshing. 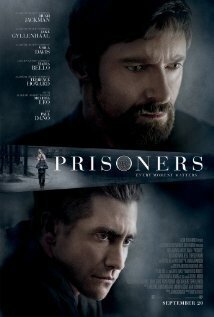 Smart and perceptive, Prisoners shows you how dark even good people can be when driven beyond their breaking point. It makes you stare at this darkness until you want to blink. Prisoners is rated R for disturbing violent content including torture, and language throughout. The running time is 2 hours and 33 minutes.